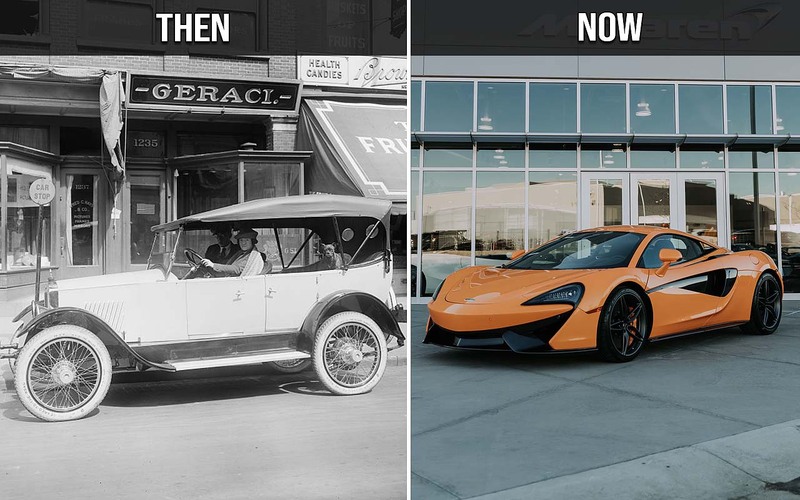 The world isn’t perfect, but it sure has changed and made many advances in various fields within the past 100 years. For instance, the life expectancy for a male born in 1915 was just 47, compared with 71 today. Gasoline was only sold in drug stores, and the vast majority of Americans didn’t graduate from high school. 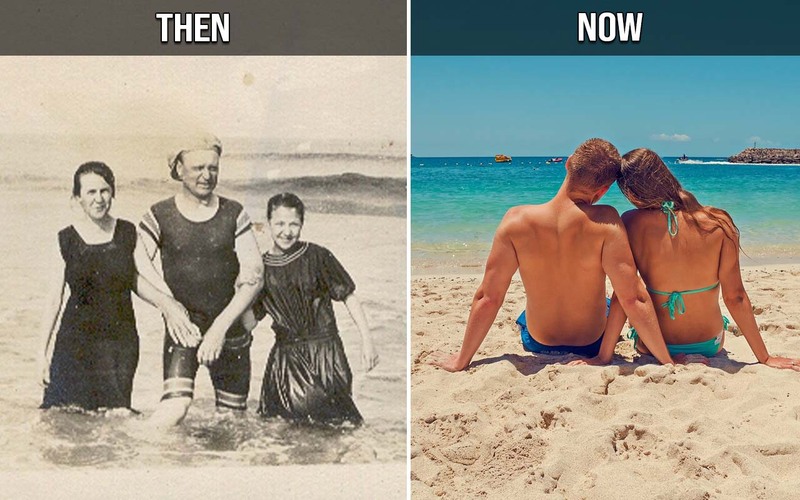 If we take a look back, we can see that the world we live in today is a whole lot different that what it once was. 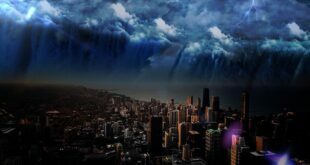 Here’s a list along with images, that compares our world today with what was like a century ago. 1. Spending a day at the beach. Believe it or not, during the 1900’s, there were laws in place that forbid women from wearing one piece bathing suits. One of the famous cases involves Annette Kellerman, an Australian swimmer, who was arrested for wearing a fitted, sleeveless, one-piece bathing suit on the beach in Boston in 1907. When beach activities became more popular, women were required to wear a long, one piece bathing suit, with stockings as well. The beach police patrolled the areas and measured the length of bathing suits (if necessary) and either fined them or sent them to jail for breaking the law. Thankfully, those days are long gone. 2. 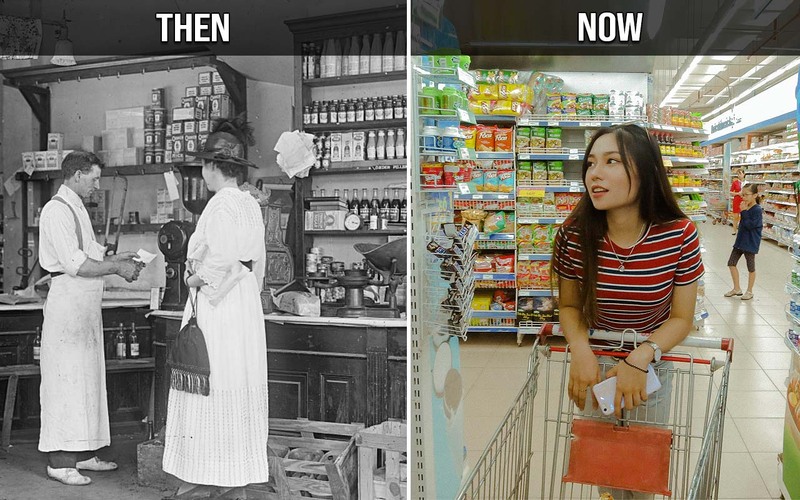 How grocery shopping has changed over time. Today, pushing a cart or carrying a basket through Walmart feels completely normal to us and is a part of our every day lives. It is estimated that an average human spends around 30-45 minutes every week at a grocery store. The first modern American supermarket opened 103 years ago. Clarence Saunders opened the first Piggly Wiggly on September 11, 1916 in Memphis, Tennessee. However, life was a lot different back then, before the world of supermarkets. Instead of carts, customers would pass the clerk a list, who would put items together for shoppers in one bag. Piggly Wiggly changed that shopping style, allowing the customers to choose between different brands at their convenience. 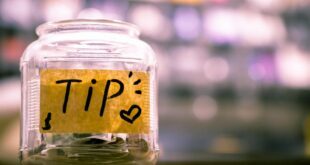 The first supermarket is also responsible for introducing shopping baskets, price-marked items, employees in uniform and the supermarket franchise model. 3. 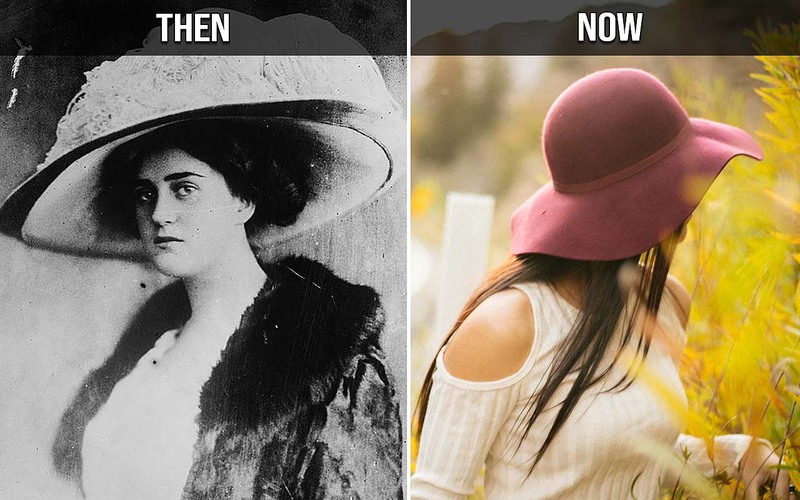 British women wearing hats to every major occasion, including the Royal Wedding. According to royal protocol, women must wear hats to all official occasions. 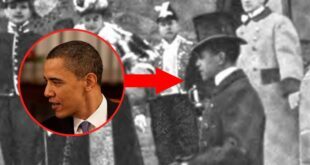 They are considered as part of the “social fabric” and every upper class and royal woman attending a special occasion must wear a hat in order to achieve a formal look. 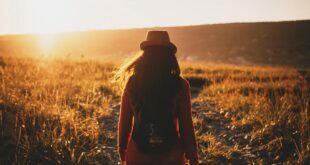 The stipulation dates back to before the 1950’s, where women were rarely allowed to show their hair in public. Obviously, times have changed since then. One of the best examples is Catherine, Duchess of Cambridge, Kate Middleton, who incorporates centuries old traditions with her current style. 4. When the world of advertising was a newborn and fairly popular. The ads shown in Times Square targets millions of tourists who flock together from different parts of the world. 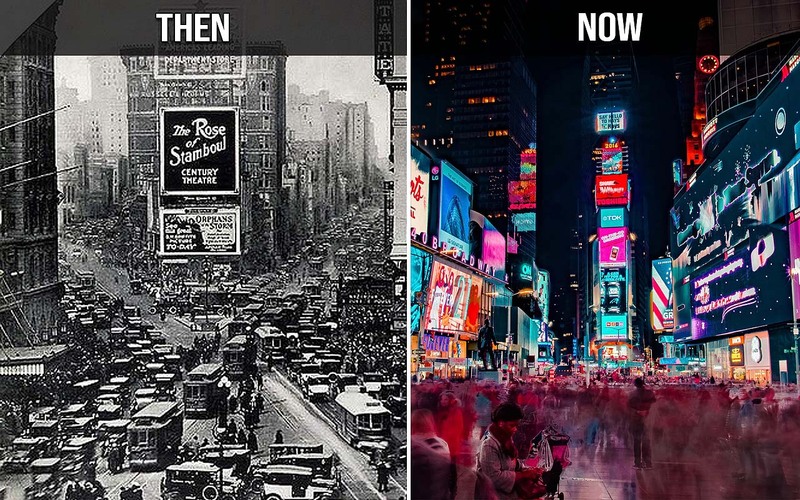 The first electric advertisement went up there in 1904 and since then, the advertisement industry in Times Square took off to cover almost every nook and corner. 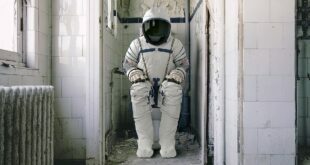 Today, the ads are feats of engineering and are definitely impressive to observe. While tourists do everything in their power to stay away from the ads, engineers do everything they can to grab their attention. According to Business Insider, the Times Square billboards on average have more square feet than the average New York City apartment. The average one-bedroom apartment in New York City is a measly 784 square feet, whereas the glitzy branded messages of Times Square are 2,013.25 square feet. 5. Cruising the streets in your new car. Cars have been around in the US since 1885, when Karl Benz built his first automobile in Mannheim. By 1900, there were only 4,192 passenger cars built in the US, and by 1985 there were 109 million cars in existence. As of 2018, there were some 272.1 million vehicles operating on roads throughout the United States, with around 222 million drivers holding a valid license. Now let that sink in for a moment. 6. 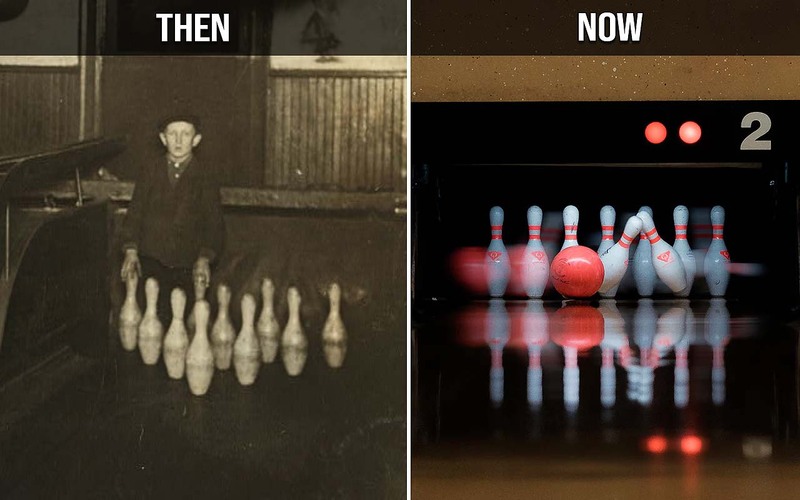 Before bowling was automated, the pins were manually set by young men who were called pinsetters. Before machines took over the game of bowling, there were pinsetters, or pin spotters, whose jobs were to manually reset bowling pins to their correct position, clear fallen pins, and return bowling balls to players. The people who opted for this job were mainly young men since it paid very little and most games took place in the evenings or late night. It wasn’t until 1936, when Gottfried Schmidt invented the first mechanical pinsetter, that the manual profession became a part of history. 7. Selfie, before it was cool. 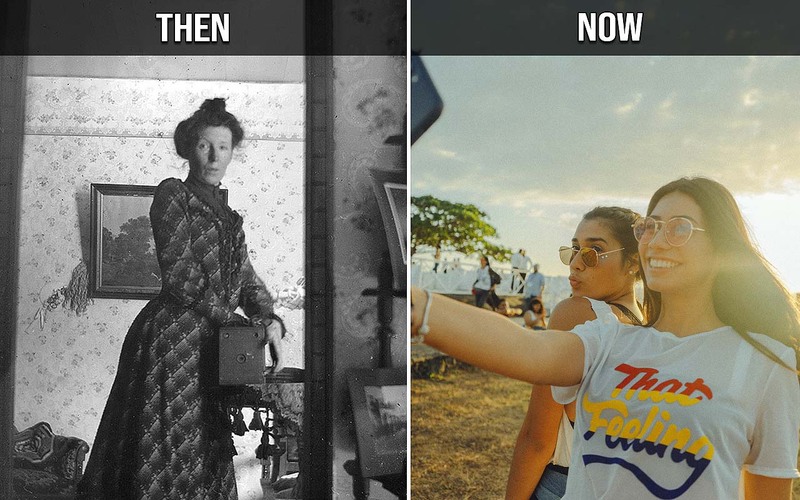 The image on the left, which shows a woman taking her picture in a mirror, c. 1900, a century before selfie became a thing. In fact, the first selfie dates back to 1839, when Robert Cornelius took his own picture. His picture is also considered to be the first photographic portrait image of a human ever produced. Today, Google states that about 93 million selfies were taken per day as far back as 2014, on Android devices alone. A study by Now Sourcing and Frames Direct revealed that the average millennial will spend an hour a week on selfie duty, which adds up to 25,000 selfies in their lifetime. 8. Posing for a photo with your phone. Today, phones are an integral part of our lives. We can’t imagine a life without them. Most of us carry our phones everywhere and spend more time with it than we do with our loved ones. Before the modern mobile phones, there was a world where owning a phone meant pride and status. Desk Stands, often called “candlestick” telephones, were the first desk telephones manufactured by Western Electric around the 1900’s. 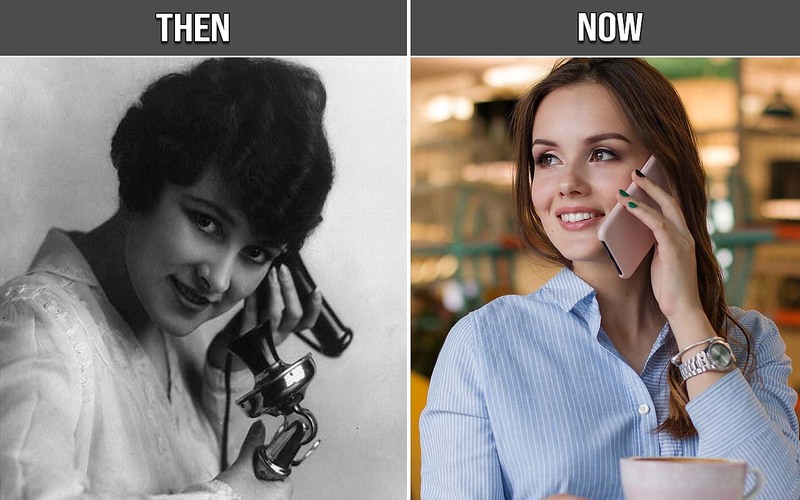 Some of the most beautiful telephones ever made were introduced during this period. 9. The daunting task of doing laundry. Before machines took over, people cleaned their clothes by pounding them on rocks or rubbing them with abrasive sands until the dirt came off. They performed the daunting task in rivers and lakes. By the mid-1800s, during the industrial revolution, the washer was born. Although it is hard to determine its exact creators, the washers were made of wood and were hand-powered. 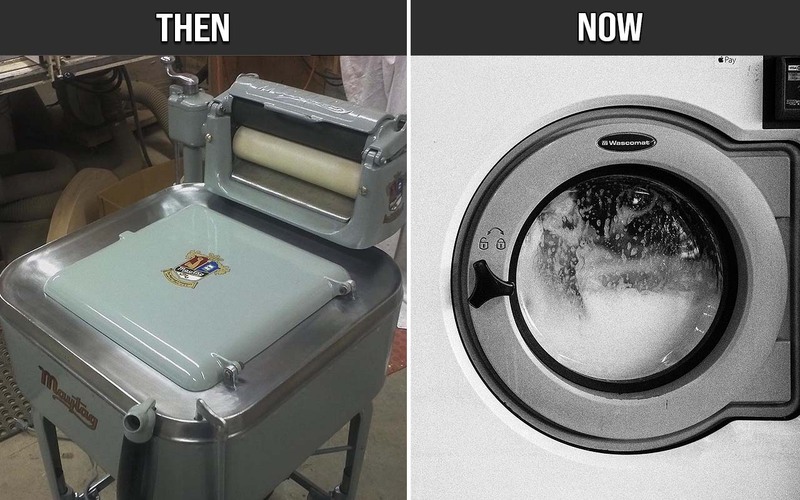 In 1908, the Thor became the first commercial electric washer. The first computer-controlled consumer washer appeared in 1998. 10. 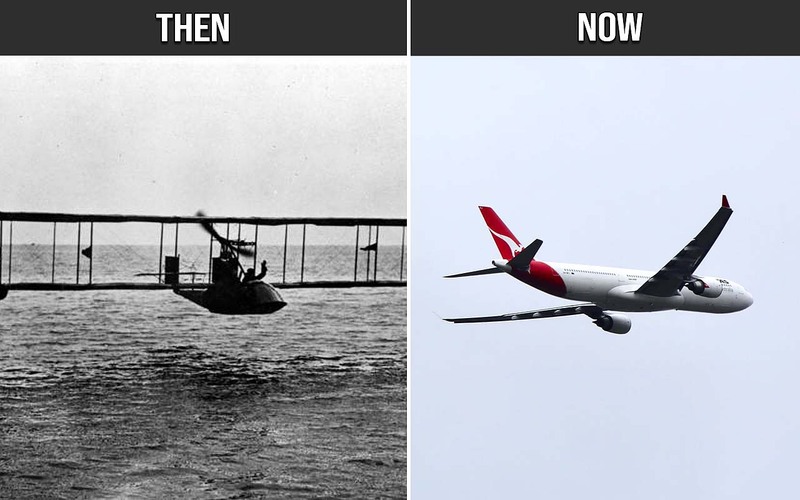 How the world of aviation changed in 100 years. On January 1, 1914, the world’s first scheduled passenger airline service took off, operating between St. Petersburg and Tampa, Florida. The St. Petersburg-Tampa Airboat Line was a short-lived endeavor, but it paved the way for today’s daily transcontinental flights. The first flight’s pilot was Tony Jannus, an experienced test pilot and the first paying passenger was Abram C. Pheil, former mayor of St. Petersburg. Today, the largest commercial passenger aircraft is the Airbus A380, which can hold 544 people. If all the seats were economy, it could carry a maximum of 853 passengers. 11. Horse drawn vehicles delivered mail from 1900 to 1918. Before gasoline buggies were accepted by the public, especially the residents of Nantucket, mail was delivered in a different fashion. According to the Nantucket Historical Association Library, from 1900 to 1918, Nantucket was the only place in the nation that successfully fought encroachment of the automobile within its limits. Opposing politicians on the mainland and large property owners, mostly non-residents, Nantucketers kept the island free of the “gasoline buggy” until the final vote of the town on May 15, 1918. By the narrow margin of forty – 326 to 286 – the automobile was allowed entry. 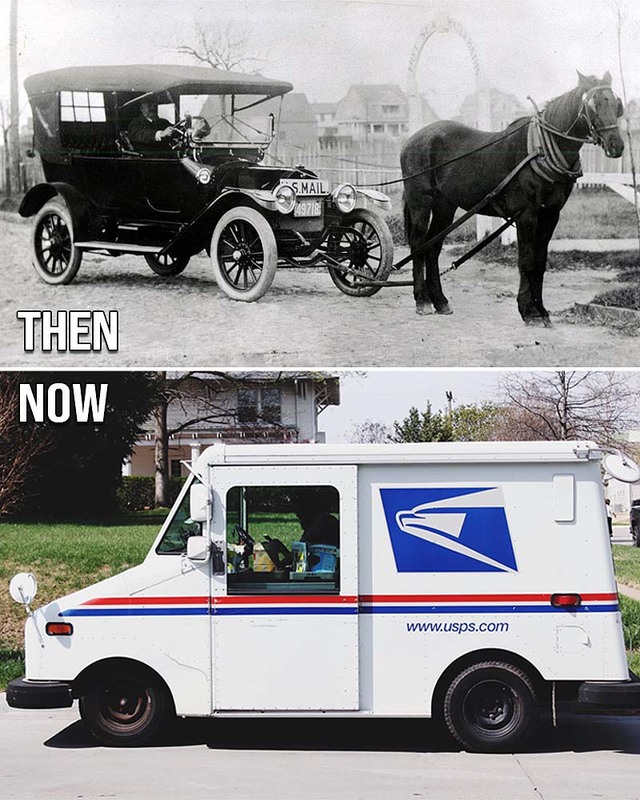 Until then, horses were used to pull buggies around town to successfully deliver mail.